Author of Uncle Tom's Cabin, Stowe was a tireless advocate for the abolition of slavery, temperance in the use of alcohol, and getting the vote for women. 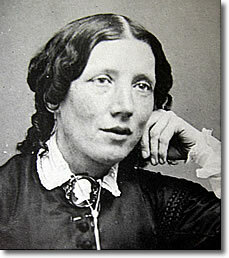 Born in Litchfield CT, Harriet Beecher Stowe (1811-1896) was the daughter of Reverend Lyman Beecher, a minister whose rigorous life was a testament to his Puritan beliefs. 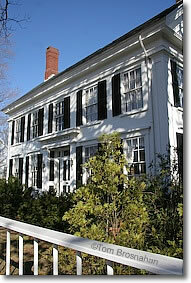 A wife, mother, teacher and author, Harriet Beecher Stowe was living in Brunswick, Maine, site of Bowdoin College, when she wrote Uncle Tom's Cabin (1851-52), published first as a series of installments in an anti-slavery magazine, then as a book. Her poignant novel about a runaway slave became a huge national bestseller, with an unprecedented 300,000 copies sold within a year of publication. Even though the novel was not specifically anti-slavery or pro-Abolition, it became an Abolitionist favorite, changing the laisez-faire attitude of many in the northern states to one of active disapproval of slavery—which was its author's goal. The novel was translated, published and read abroad as well, especially in Great Britain. Stowe raised six children, kept house, wrote novels, poems, essays and magazine articles, and worked tirelessly for temperance and women's suffrage and Women's rights as well as the abolition of slavery.